Hey guys! A lot of info here, let me know if I forgot anything. Days of the Dead- We dropped the ball on this one, didn't do any paperwork or much planning,so we didn't attend in any official capacity. Would be worth tabling at next year. Revisit in the fall. Stand Alone (ish) Blood Drive- Slugg is taking point on a stand aloneish ZS blood drive (might be a partnership with his church). Most likely out on his side of town (Jackson). He's got just about everything figured out, and will let us know the whens and wheres and where we are with the paperwork. Food Drive- We will still be doing a canned food drive at the next Nukelanta event. Slugg has been running the prep for this drive, but the date of the event has been pushed back. He'll keep us informed as he hears more. Between this and one of the blood drives, that's our required volunteer events done and done. Everything else is just icing on the cake, so think of whatever other volunteer events you'd like to try. If we try them and fail, at least we have our 2 required events out of the way, so no big deal. Learn and try again. MBO- Slugg is also working on this. Looking like it'll be at Dauset Trail, but that's subject to change. More details as he finalizes them. Momocon (May 26th-May 29th)- we are going to pass. Not a ton of interest, don't think we'd get the best bang for our buck. We'll see if feelings change next year. Dragoncon (Sept 2nd-Sept 5th)- I've contacted HQ and the Apocalypse rising track about Dragoncon, haven't heard anything back. Going to try again. We want to attend in an official capacity. There is interest in walking in the parade (we'll move on that soon), taking part in the walk and potentially doing something with the prom. We have some time to play with while I attempt to contact HQ and Apoc Rising again, but we need to move on some of these soon. I will also make a new post on the forums and see if any other chapters are planning on coming down. Hard Labor Creek State Park- We had a good time there at our reinstatement event last spring. I'm going to contact them soon to see if they're having any spring/summer volunteer events we can work at. I'll keep you posted. Spring Clothes Drive- I was thinking we could do a clothes drive closer to the end of spring. Pick up all the winter gear people don't want, and all the summer clothes they don't fit into anymore. Possibly donate it to Must Ministries (Mara suggested them last year) unless someone has another place they'd like to donate to. When would y'all want to do this? Renfest- Kate and I are going in late April (23rd and 24th, I think). Wouldn't be an official ZS event, but if anyone wanted to join us up there, it'd be a good time. I think it that Saturday is the Dauset Trail festival (more on that later), so conflicting events that weekend. Mill Springs class presentation- At Techfest, Tbrents spoke with someone with Mill Springs Academy. They thought we could do a class presentation or something to their middle school children. It's something we'd have to take about, but for the time being they haven't even contacted Tim to move this along. We'll wait until then. Dalton Ham fest (Feb 27th)- We're passing on this as an official event. If y'all want to show up and hang out, I think a few of us will be there anyway. But we don't plan on tabling. Walking dead season finale- We were going to do something for the walking dead mid-season premier... until I remembered it was on Sunday. So now we're going to try and do a canned food drive or something at the season finale at a bar. Davo is taking point on this one. Zombie Pub Crawl (July 30th)- We didn't do anything official with the zombie pub crawl in Atlanta last year. Might be doing something this year. I'm looking into it, we have a little time. County Emergency Preparedness festivals- We unofficially went to the Dekalb county festival last year, were received well, and had a good time. Davo is looking into all the other county festivals, and we'll go from there. Free to attend, free to table (I believe) and specifically tailored to an aspect of our group. Can't go wrong. Fox Hunt- Also at Tech Fest, tbrents was approached by another organization (GARS?) and they challenged us to a fox hunt. I don't know a ton about it, but I think he made another topic on the forum about it. There was great interest in this, so we'll be doing that, so long as we get the paperwork and supplies for it in time. Potential Camping location- tbrents has access to 12 acres for potential camping and other activities down the road. Nothing planned as of now, just something to keep in the back of our minds. Tony Serrano Century Ride (April 9th)- tbrents volunteers at this event every year. It is a bike ride (not motorcycle ride) and there are radio operator volunteers at all of the checkpoints as a constant source of communication and emergency contact. There was interest in this at the meeting, be just need to get rolling on the paperwork for HQ and contacting them. Tbrents or KJ4ZDD, either of you want to take the lead on this? Walker Stalker Con (October 28th-30th)- we passed on this last year because we were conned out, had short notice, and thought it was too "corporate", but we were urged to reconsider this year. We'll revisit this in a few months. Prepper show (October and potentially April)- Didn't talk much about these, but they exist if we want to table at one of them again. Orienteering- tbrents brough up an orienteering thing he has done before, and there was some interest at the meeting. We'll look into doing this. It would be more of a skills training, not a volunteer event. Atlanta Hamfest (June 4th)- Another Hamfest, KJ4ZDD is taking the lead on this. We seem to do well at Hamfests. Make good connections, get invited to new events, gain some new active members (hi tbrents). I'm all for Hamfests. April- Saturday the 9th, at the bike ride volunteer event, after the event. Our skills training will be hands on at the event. Nobody but tbrent has done this before, so it'll be a learning experience for us all. June- Saturday the 11th, date subject to change. Meeting followed by zombie movie night at a private residence. Officers or core members only (Also don't want to be inviting everyone and their mother to this one). New year, new officers. modF was voted down for chapter inactivity. Still a much beloved member, no longer an officer. Davo stepped down from his role as well. KJ4ZDD and myself will fill the empty positions. I still have to bring this up with HQ to get it changed and deal with the fun official stuff. In September, in accordance with the bylaws, we will hold an election and the officers may change again then. 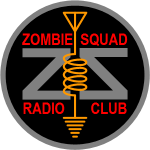 KJ4ZDD is looking into a ZS radio club banner to use at Hamfests. I think that's all of it. A lot of info, I know. Let me know if I forgot anything. I'm sure many of these events will pop up as their own forum topics here soon. The Walton County Repeater Group is having their monthly meeting this Thursday evening and that is where we will be discussing the bike ride. If you would like to volunteer for this event it would be good if you could come to that meeting or the one next month so the organizers can get you officially involved. The meetings are the third Thursday of every month. Also on the odd numbered months they do testing for ham radio licenses before the meetings so those of you looking to get your license could take advantage of that as well. I know this is short notice for this month but I wanted to give you the info in case you could make it. The meetings are held at 7:30 pm, at the Walton County Fire Rescue Headquarters. The testing sessions begin at 6:30. The address is 1000 Heritage Pkwy, Between, GA 30656. I will update as I get more details. We wouldn't even need to swap out equipment, as this antenna does both bands.